In high school, a boy had suicidal thoughts. Maybe this was false dreaming. If he had a gun, would he actually have done it? Still, purpose, hope, and happiness were hard to come by. Today, that boy wakes up everyday, excited to connect with and serve the people who he shares space with. He gets to reduce other people’s pain. At first, it’s physical. After 4 visits, my pain is 20% reduced. “Great,” he thinks to himself. I get to be paid, but my heart isn’t full yet. Eventually, opportunity to go deeper down the rabbit hole presents itself. Boy: How are you today, (enter your name here)? You: I’m the same, all is OK. Boy: (Looking you in the eye, desperately wanting to connect hearts) What’s really going on? You: Well … I’m not fulfilled with my job, my kids are struggling in school, my husband and I haven’t gone on a date in years, and I don’t know how I’m going to make it to tomorrow. Boy: Thank you for being real. Let’s talk about your life as a possibility. And the emotional and spiritual connection is born. Because you were humble enough to want more for yourself. Less physical, emotional and spiritual pain. More purpose, fulfillment, bliss, and happiness on a daily basis. If you haven’t figured it out yet, that boy was me, Dr. Chris. I’ve written before about my past struggles with hopelessness, my hero’s journey into the darkness, facing and slaying some monsters, while others continue to haunt me. I’ve broken open my head some and perceived, not snapped, my way out of depression. The truth is that the past two weeks have been the happiest I’ve been in a long time. I’m reading a book a week again like I used to in chiropractic school. I’m meditating, eating well, exercising in a way that builds up my body’s health and fitness, and being present with whoever is in front of me. I’m taking a seminar every other month, scheduling the four vacations a year I promised myself several years ago, and making date time for Katie. A major reason is that the internal work I’ve been doing between Landmark, psychedelic substances, meditation, and couples therapy with Katie has reached a tipping point. The ones I see on a daily basis. Or the ones I don’t see who I know pray for me and send me positive juju vibes. What really blows me away, is those of you who trust me enough to let me help, support, and serve the people in your life who are suffering physically, mentionally, emotionally, and spiritually. Recently, I’ve been looking at the numbers for Barefoot Rehab: our income, patient volume, and where we get our patients from. The past three months since Dr. Curtis started with us in February have been the busiest we’ve ever seen. Dr. Curtis might say it’s because he is with Barefoot Rehab (haha), and I’d agree to that. But I’d also say it’s because I’ve noticed that the staff at Barefoot Rehab are connecting with people more than ever before. Additionally, you are trusting Dr. Curtis and I to take care of the people you care about in your life. I’ve always known (since I started practicing pain resolution in 2010) that the reason why I get to wake up and do what I love to do on a daily basis was because patients referred to me. What surprised me was what the actual number was. 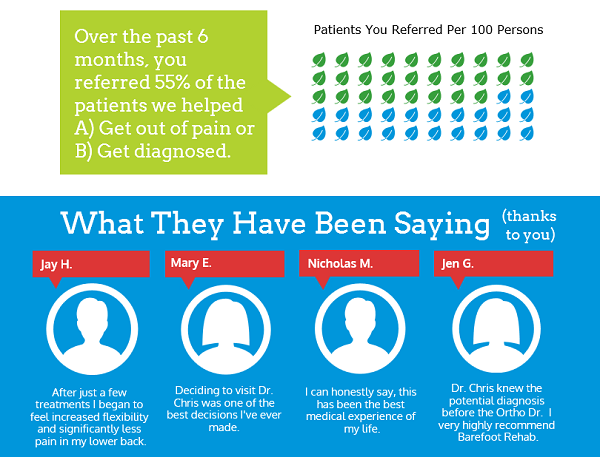 More than half of the patients we’ve seen over the past six months, more than half of Barefoot Rehab’s revenue, occurs because YOU refer people you know to us. If you know someone who is suffering and hasn’t found help yet. That person probably doesn’t know where to turn. Or they think they have to live with the pain that is affecting them …. Please share who we are, what we do, and why we do it with them. If he or she isn’t convinced, here’s the proof. We are here to serve and we know our limits. We will always respect the humanity in any person (or living thing) that walks through our doors. Tell us what your community means to you? Do you ever take time to reflect on the people you’ve surrounded yourself with? When you look, what do you see? How have people impacted you? When is the last time you said thanks to them?